France has a new president. Emmanuel Macron — an independent centrist who has never held elected office — has won a resounding victory over far-right, nationalist Marine Le Pen in the most important French presidential race in decades. According to the French Interior Ministry and multiple news outlets, Macron won with near 66 percent of the vote over Le Pen’s just over 34 percent. In his victory speech outside Paris’ Louvre Museum, where thousands of Macron supporters gathered, the 39-year-old vowed to bring “hope and renewed confidence” to France amid widened social rifts exposed by the election campaign. Le Pen called to congratulate Macron and conceded defeat to a gathering of supporters of her National Front party in Paris. But she vowed to continue her fight. Macron, who has never held elective office, is set to become the youngest president in modern French history. 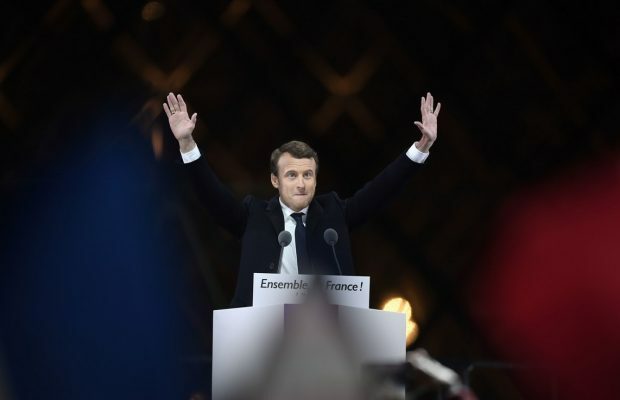 His improbable path to victory has been extraordinary in that it included dispatching France’s two major political parties, the Socialists and the Republicans. Macron does not have a lot of time to savor his victory. His movement, En Marche! (Onwards! ), which he created last year, does not hold a single seat in France’s lower-house of parliament. If Macron hopes to govern effectively, his party needs to win as many seats as it can in legislative elections scheduled for next month. Corinne Mellul, who teaches political science at Catholic University of Lille in northern France, noted that although Le Pen lost, she did far better that her father, Jean-Marie Le Pen. Jean-Marie Le Pen founded the National Front in 1972. For much of its existence, the party was treated as a political pariah. When Jean-Marie advanced to the run-off in the 2002 presidential race, his candidacy provoked street protests and the other political parties called on their voters to reject him. As a consequence, center-right President Jacques Chirac won a second term in a landslide with Jean-Marie Le Pen receiving less than 18 percent of the vote. The French presidential race — which has been closely watched around the world — became the latest referendum in the West on globalization and its benefits and societal costs. The race here also focused on the deeper question of what it means to be French. As the day began, French voters faced a stark choice. Macron, 39, is an avowed internationalist who speaks fluent English and envisions a France deeply integrated with Europe and open to the world. The France Le Pen described to supporters in her National Front party could not be more different. Le Pen, 48, had called for a temporary ban on immigration, a referendum to leave the European Union and replacing the Euro with the Franc, the old French currency. Among those cheering Macron’s victory are officials in Brussels who work with the European Union. The E.U. is in the early stages of negotiating the exit of the United Kingdom, which is seen as damaging to the 28-member trading block, but not fatal. Le Pen had promised as president to call a referendum to pull France out of the E.U., which would have threatened to destroy the institution. Macron’s victory is not a surprise as polls routinely showed him far ahead of Le Pen. Political observers insisted that she faced an electoral glass ceiling because they perceived her positions as too extreme to win over the majority of French voters. The final week of the race was marked by dramatic twists and turns. On Wednesday, the candidates faced off in a gripping televised debate that ran two and a half hours without any commercial breaks. Le Pen, who is a fiery speaker with a laser-focused message, was expected to clobber Macron, who has little political experience. Macron had served as economy minister in the outgoing, deeply unpopular government of President Francois Hollande. Le Pen spent most of the evening on the attack, but provided few detailed solutions to France’s myriad problems, which include a 23-percent youth unemployment rate and a spate of horrifying, terrorist attacks in recent two years. Both the news media and public opinion suggested Macron was the clear winner. 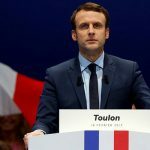 On Friday, hackers dumped a trove of emails from Macron’s campaign on the internet in an apparent attempt to damage his candidacy just ahead of today’s vote. 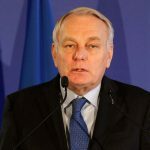 But the French government warned both the media and citizens not to spread the hacked documents and abide by a traditional black-out ahead of the vote. The hacked documents did not appear to gain much traction and were not seen to have an effect on today’s results. 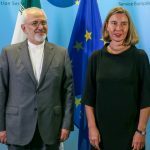 How does Macron think about France’s relations with Iran and Saudi A.?